Connector beams grouted in place achieved full strength for rail traffic within eight hours. 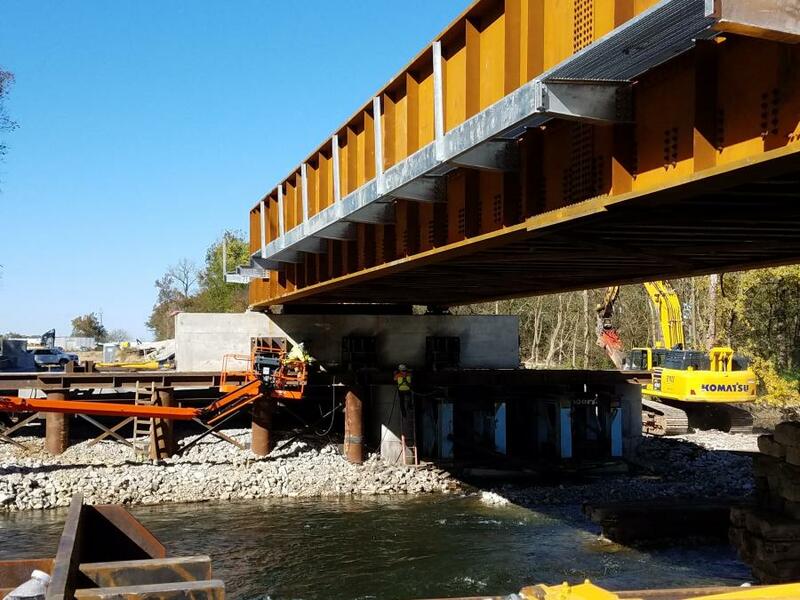 This fall, Fay, an i+iconUSA Company, managed the design-build replacement of the Flat Rock River Bridge in Columbus, Ind., completing the project in only 50 hours, well in advance of a 96-hour outage deadline. 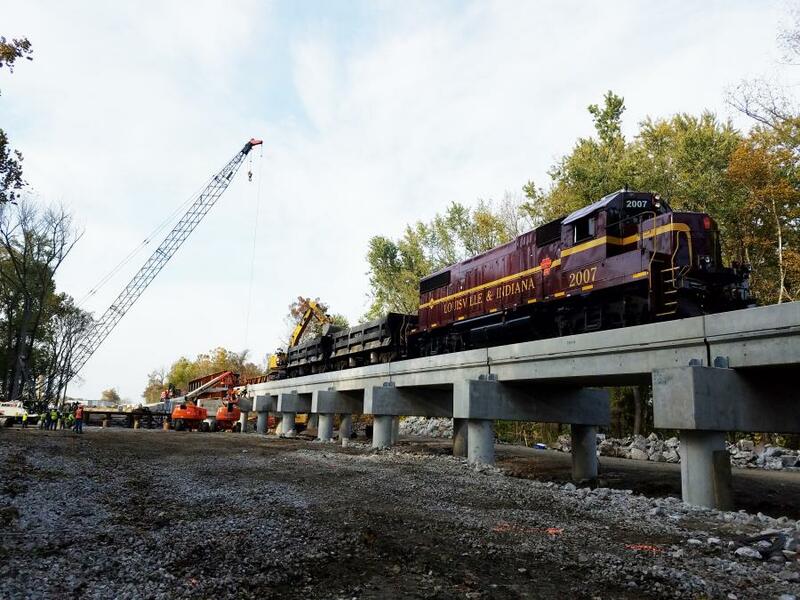 The project was done for Louisville & Indiana Rail (LIRC), which is part of Anacostia Rail Holdings. 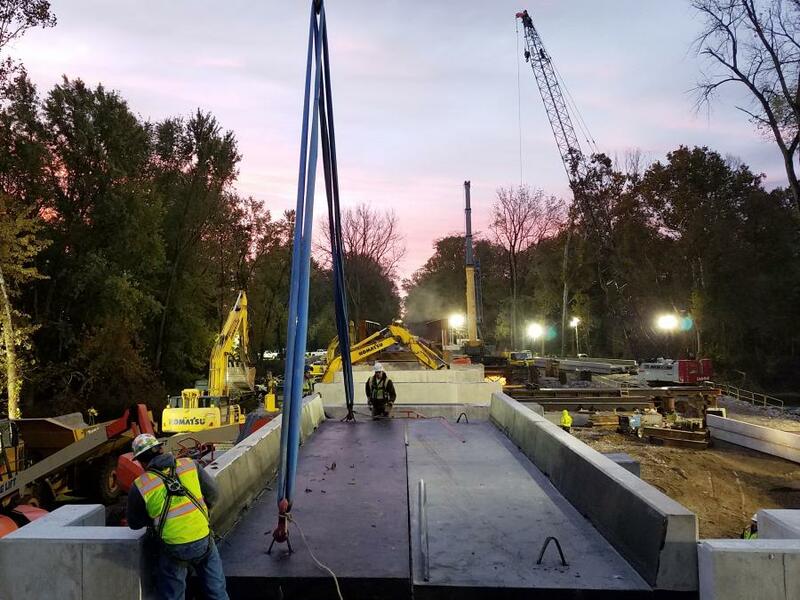 Fay demolished the old bridge and installed its replacement using a jack-and-slide method, with the outage portion of the work complete on Oct. 31. The bridge is located at Milepost 40.19 of the Louisville and Indiana Railroad. The former structure consisted of two 144-ft. through-truss spans and seven 30-ft. steel-deck girder approach spans, with an overall length of 498 ft. Fay replaced it with a new 118-ft. through-plate girder-span bridge and 13 approach spans ranging in length from 30 ft. to 34 ft.
Brendan Lynam, Fay's operations director, was in charge of the project, and Chuck Grabner served as project manager. "The main challenge on this job was completing the replacement in the allotted 96-hour shutdown timeframe," Grabner said. "Eight months of pre-planning ensured that no stone was left unturned for time savings. Internal engineered work plans and 3-D animation, which compiled all information into one platform, allowed for fine tuning of the outage work." Because the former structure was in a designated flood plain, the new bridge has its bottom flanges above the 100-year flood elevation, which proved to be the biggest challenge in the design phase of the project, according to Grabner. "This placed the revised top of the track 5 feet higher than the existing track elevation, which, coupled with the requirement to stay within existing ROW, resulted in a significant amount of retaining wall along the ROW," he said. "Working with the client to reduce roadbed width and allow for steeper-side slopes (1.5:1), the team significantly reduced retaining walls and associated project costs." Innovative planning and design facilitated rapid bridge replacement construction techniques during a single 96-hour outage, Grabner explained. Drilled shafts and precast caps were designed to allow all drilled shafts to be completed prior to the rail outage, outboard of the existing steel approach spans and trusses. During installation of the drilled shafts, the design-build team encountered unexpected ground conditions and worked together to revise the shafts' depths and installation techniques to maintain schedule and design integrity. "An innovative connection detail between the drilled shafts and precast bents allowed for quick installation of the caps and spans during the outage," Grabner said. Steel connector beams were set through an opening in the precast cap into field-cast "pockets" on top of the drilled shaft. These connector beams were then grouted in place with a high/early-strength grout, achieving full strength for rail traffic in eight hours. This work was performed using a Delmag RH20 drill, a Hammer & Steel 44HS vibratory driver/extractor and a LinkBelt 218 crane. "Due to the short timeframe, three construction operations occurred simultaneously, requiring crews from multiple job sites in different states," Grabner said. "While one crew set precast sections, another performed demolition on the north side, and yet another slid the structure's river span. Additionally, placement of ballast (not in Fay's scope), was being performed in coordination with the railroad and its subcontractors. Erection began from the outside working in towards the flanking spans so the railroad could bring in the ballast needed by rail car." Coordination of crews made it easier for LIRC to expeditiously complete the necessary work during the same outage. "All new components of the structure were successfully protected with no damage during the shutdown, which was a feat, as the entire new substructure was built just outside the original structure's drip edge," he said. Demolition operations were completed in 18 hours. The equipment used for demolition included a Komatsu PC650 with a Genesis 1200R shear, a PC600 with a Genesis 1000R shear, and PC 490s with Rammer G-110 hammers. A Grove GMK 6250L hydraulic crane was used to set the precast concrete, and during the shutdown two of these cranes were needed to execute the plan. "Planning and staging of the 39 sections of precast concrete was key to completing the shutdown ahead of schedule," Grabner said. "This project involved working in tight conditions. All staging needed to be performed on the right of way, leaving only inches of room to fit all precast concrete sections and equipment in the work zone." Staging was completed over an eight-week period since there was only one way in or out on the causeway, all while critical path operations were being completed on the same access way, he said. Concrete precast sections weighing between 51,000 to 94,000 lbs. were off-loaded utilizing two large (PC 600 and 650) excavators. In addition, Grabner said, the design of the TPG slide was unique. Ten temporary piles were driven on each side of the Flat Rock River's shoreline into shale bedrock. Everything needed for the slide was built on top of those pipe piles as temporary bents. The caps for this span were cast in place. There was not enough access for a large crane to set precast sections during the shutdown. "The section that was slid into place was approximately 1 million pounds and the allowed tolerance of final location needed to be within 1/16th of an inch," Grabner said. "Due to jack suppliers not having a double-acting 100-ton hydraulic jack capable of 48-inch or greater stroke available for rent, a new system comprised of the boom cylinders taken off the excavator was designed to push the bridge into place. This allowed for sufficient stroke to move the bridge section efficiently and also allowed for the re-use of cylinders to be mounted onto equipment for the next project. 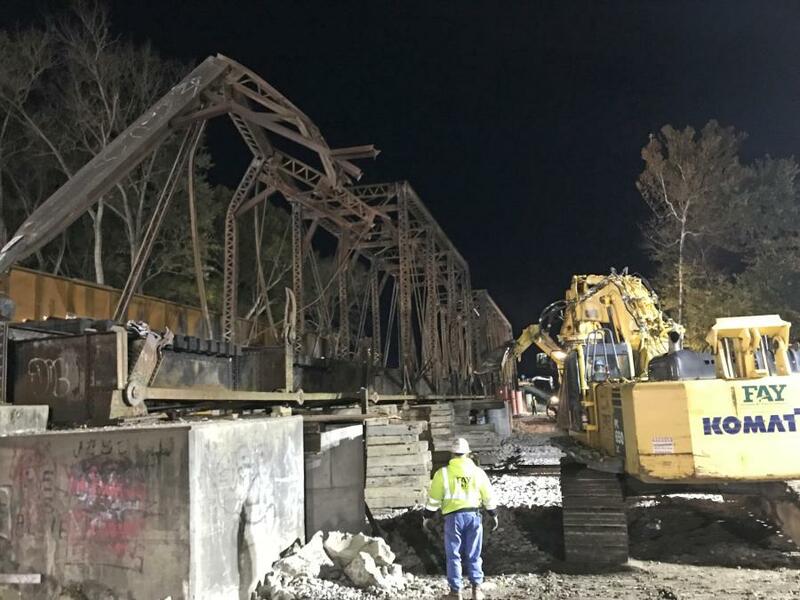 "Even though there are few truss bridges remaining in the U.S., the demolition of them is a skill set that Fay has self-performed numerous times," Grabner added. In the past two years, Fay has demolished four others from Oklahoma to Virginia, although none were railroad bridges. i+iconUSA is a family of diversified heavy-civil and industrial construction companies recognized for safe and innovative infrastructure solutions. Its origins date back to 1947 with the founding of Joseph B. Fay Company (Fay) operating primarily in the Mid-Atlantic states. Since that time, i+iconUSA has grown and expanded through acquisition and organic means. i+iconSoutheast, which began operations in 1982, focuses on the region from southern Virginia through Florida.